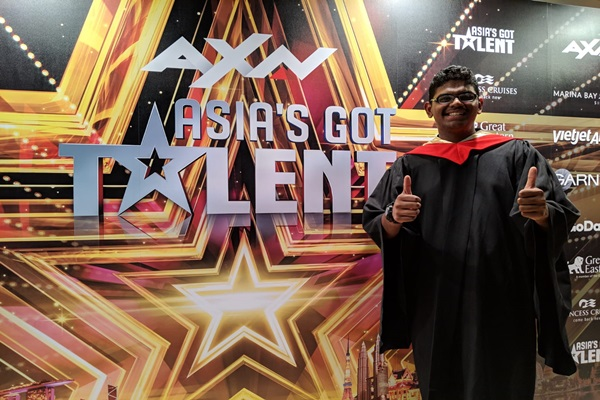 Malaysian contestant Yasshwin Sarawanan, or better known as “The Human Calculator”, won second place in Asia’s Got Talent Season 3 yesterday night (Apr 12). The results show was held in Singapore when the 15-year-old showcased his rapid-fire skills in solving Mathematics. According to NST, the first place went to Taiwanese magician Eric Chien who won US$100,000 (RM 412,790.00). For Yasshwin final celebratory show, he put up a “Back to Skool” theme and dressed like a professor. He asked all three judges, David Foster, Aggun and Jay Park, to come on stage and sit on a school setting of desks and chairs. The teen contestant also asked the show’s hosts, Alan Wong and Justin Bratton, to join the judges. He asked all three judges to give a particular event’s date and it was “The Human Calculator’s” job to find out what day of the week it fell on. Without using a thick book of a calendar, Yasshwin was able to calculate as far back as 64 years ago to identify the exact day of the week. Jay Park’s father birthday was on the 25th of January 1955, Aggun’s daughter’s birthday was on the 8th of November 2007, and Foster’s first Grammy award was received on the 5th February 1979. Yasshwin was able to calculate within seconds that the dates fell on a Tuesday, Thursday and Monday respectively. If that was not enough, Yasshwin solved a 16-layered of rapid-fire addition question which added up to 748, all in greased lightning speed. In his grand final stage on April 4, he pulled the first same act and he upped his second act into solving complex equations that involved square roots, squaring, additions and subtractions. Of what seems to be impossible to calculate without paper and pen − or a calculator − Yasshwin did it with only his brain. On the other hand, Malaysian female group “Nama” came down at the bottom three along with Filipino street-dancing group “Junior Good Vibes” and Taiwanese cyr wheel dancer “Yang Shih Hao”. For that, it concluded this season of Asia’s Got Talent. Malaysian netizens were very happy and proud of Yasshwin even though he was not the champion of the season. “There’s no prize for second. Hope some company or rich Malaysian comes forward and reward him for his achievements. Congratulations boy”, one said. You can watch Yasshwin’s grand final and results show on the next page.